Earlier this summer, I got a TON of fresh eggs. We always get really great farm fresh eggs throughout the year, but during two weeks of summer, we somehow ended up with 8 dozen eggs. Yes, 8 dozen eggs. We got some from Weldon and Ariana, but also from two of my mom’s co workers, who happen to raise chickens on their farm. Besides having omelets everyday, we made such dishes as fried eggs with celery pesto, huevos rancheros, and spaghetti carbonara. We made deserts, too. But I think I must have made at least 2 dozen deviled eggs. They were great to take to backyard BBQ’s, cocktail parties, or put on a salad for lunch. I gave out a bunch to my farmer’s market friends one day and they loved them. I made some with smoked salmon, as documented here, and even made a B.L.T. deviled egg, which had smoked bacon and diced tomatoes mixed up with the filling and a small lettuce heart sitting on top! Put the yolks in a bowl and mash them with a fork. Add the mayonnaise, sour cream, smoked salmon, green onions, capers, parsley, lemon zest, and lemon juice. Combine everything and season to taste with salt and pepper. Either pipe or spoon the egg yolk mixture back into the egg white halves. Garnish with some paprika and some extra sliced green onions or fresh herbs. Vivek, nice to meet you at the Forum this weekend. 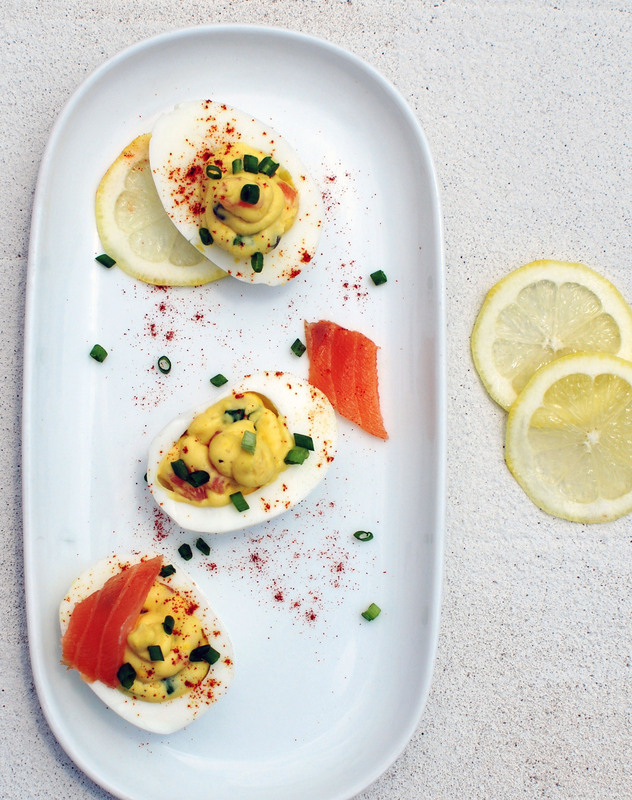 Beautiful photo of one of my favorite foods…stuffed eggs. Very nice indeed.